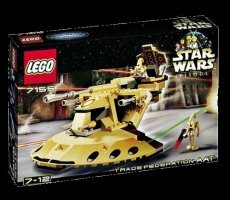 Those clever boffins at Lego have designed probably the best looking Star Wars kit with its Trade Federation Armoured All Terain (ATT) vehicle. The kit comes compete with two Imperial Battle Driods and two further suggested vehicles that can be made using the same Lego. For those of you that thought Lego was merely for kids then this will convert you for ever. It looks good and at £18 it is one of the cheapest and most enjoyable way to keep the little 'uns happy. I actually bought this kit to give to my 8-year old on a rainy day and when that day finally came I had to physically stop myself from wading in and taking over. Go on! You know you want one (for goodness sake it's worth spending the money just for the little, detailed Imperial Battle Droids). It's getting to the point where I am actually looking forward to Lucas' next installment simply so that Lego will release some new kits.